Back in 2015, The Washington Post ran an article on how 30% of U.S. companies were not hosting a year-end party for employees. This marked a record high decline in employer holiday parties. Where are we now? Put on Your Party Shoes? Things may be more festive this year. Corporate profits and unemployment are two factors that determine whether holiday parties are feasible for businesses. Profits have been up this year and the national unemployment rate is relatively low at 4.4%. Many employers opt to have holiday parties during the workday, particularly around the lunch hour or near the end of the day. Those who want to host evening events may find Sunday or Monday to be advantageous as they bypass restaurant and venue premiums and naturally help employees reign it in, knowing they have to go to work the next day. Another growing trend is to move the holiday party to another time of the year altogether. You can coin it an employee appreciation event and book it in January or October. Another idea is to host an employee family picnic in the summer. Be sure to check out the prices associated with plated meals, buffets, family style options, and other trendy formats. Plated meals may be surprisingly affordable because the caterer knows exactly how much food to purchase. Food stations or food carts may be a fun spin on things too. Different stations can be positioned throughout your venue or food trucks can congregate in your parking lot. Portion sizes may be small, but there can be a lot of variety. Another variation is a cocktail-style setup. Hors d’oeuvres are offered all evening instead of a formal sit-down meal. Employers can require employees to attend holiday parties both during and after work, but it’s not recommended. Holiday parties are tax deductible so long as every employee at every level is invited and the cost is reasonable. Employees don’t have to talk about business at a company holiday party. Employees still need to behave professionally (HR’s biggest challenge) at employer holiday parties. Avoid politics, office gossip, and anything questionable. Cash bonuses, gift certificates, and other monetary equivalents are taxable. Holiday gifts of minimal value may be tax-free. Nonexempt employees still need to receive their regular pay if a holiday party is held during their regularly scheduled work hours. 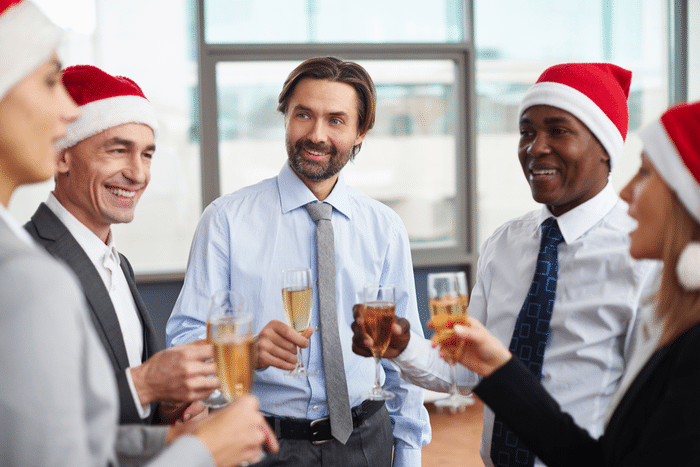 The IRS doesn’t forbid employers from serving alcohol at holiday parties, which means that if you do, you’ll still qualify for a tax deduction. However, you can help your employees drink responsibly and save a little money while you’re at it. Hire a professional bartender, don’t let employees serve themselves, card them, and help them get home safely with free rides. Your company’s normal insurance plan may not cover events where alcohol is served. Special events or dream shop policies may give you the coverage you need. Don’t miss our “Ho, Ho, Whoa! Keeping Holiday Parties, Gifting & Religious Accommodations in Perspective” webinar.